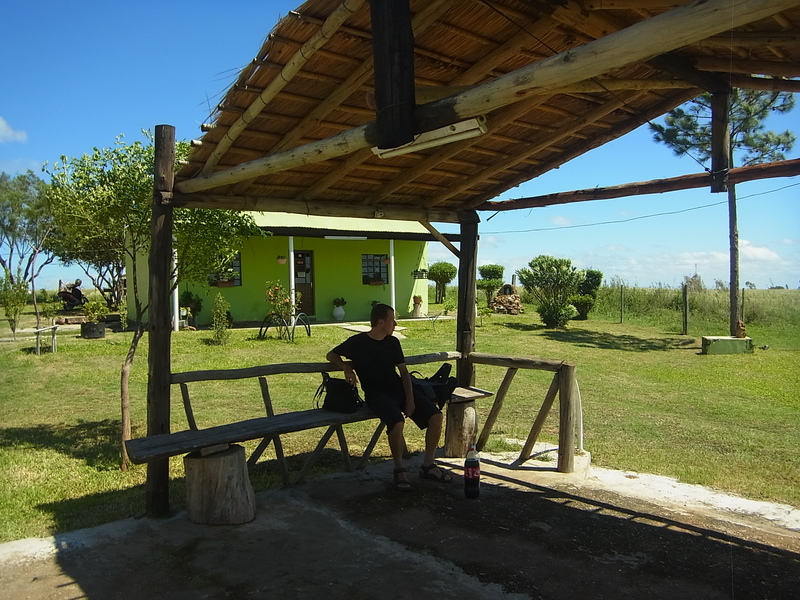 Since it´s only early afternoon when we´re dropped off at the Salto Shopping Center, we will ride on north for a few hours. 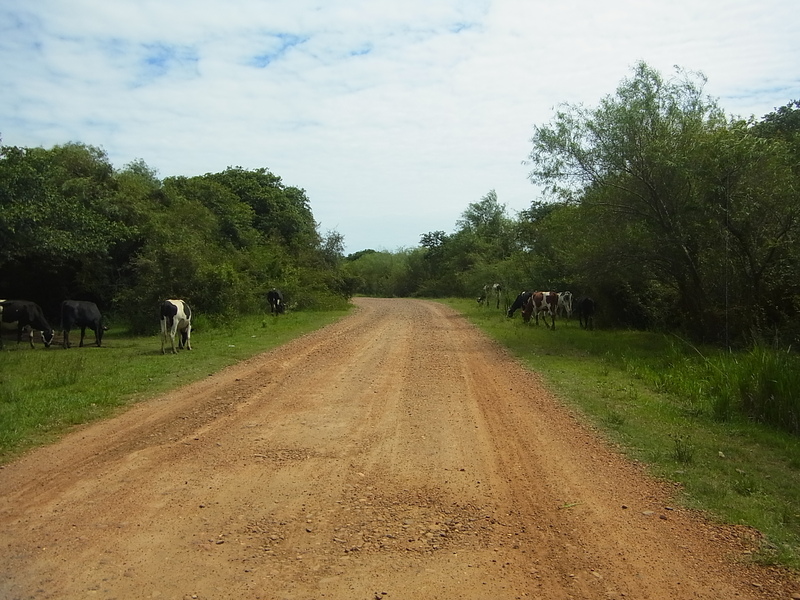 We seek our way out of town onto the Ruta 3, direction Bella Union. 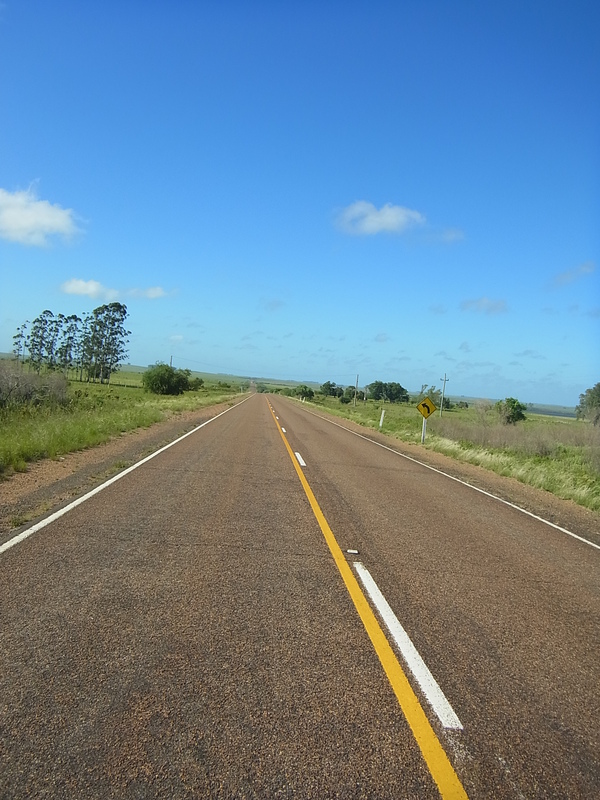 Although this Ruta 3 is the main way north on the litoral part of Uruguay, there is not much traffic which is a welcome change to the busy Ruta 14 we had the last days in Argentina. 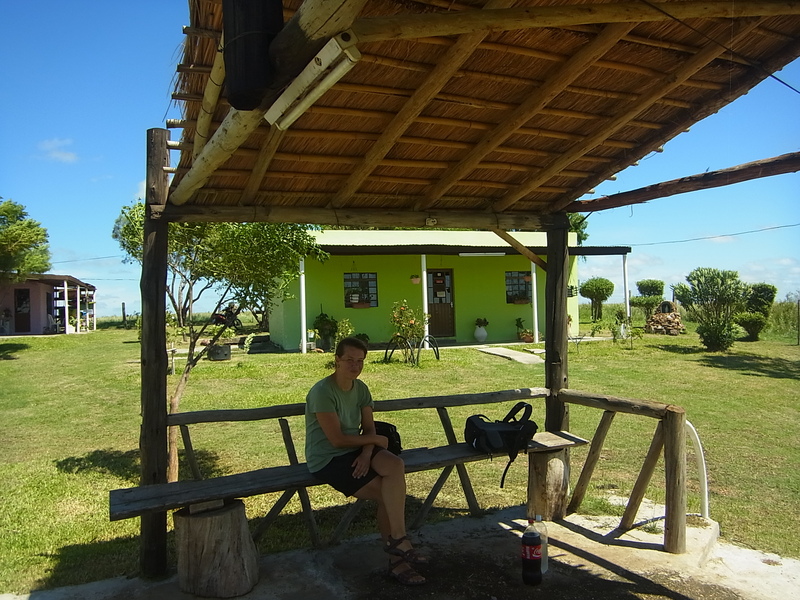 After about 5 km on the Ruta 3, we see a small “Almacen” (shop) with a table and some chairs in front of it, where we decide to take lunch. The shop itself is closed at first, but after a little while the owner appears and we can fill up on supplies. Then we cycle another 20km on, and start to seek shelter. We donˋt have to search very long, the only possibility is a small flat piece of grass next to the gate to a finca on the edge of the street. The sun is out early the next day, and so are we. With the wind coming from the right hand side – sometimes in favour sometimes not, we cycle on to Belen. We have to get off the road and make a detour, but it turns out to be a good choice. We have afternoon siesta on the center place – nice little park with trees and benches – can dry our tent in the midday sun and, more important, stock up our water supplies. As we start out again, it´s the same story as before: camp site next to the road, early sun, a soaking wet tent and a lot of wind. This time though, the wind is against us and cycling is very hard on these open roads which constantly go uphill and downhill. Instead we look for the local campsite and following the unpaved rambla find it 7km out of town. Our dream of a refreshing shower after three days cycling doesn´t come true – the sanitary equipment consists of two dirty toilets – but it´s free and we get a nice spot to put up our tent. We spend the afternoon lying around in the shades, relaxing a bit and enjoying ourselves through playing sudoku and different cardgames. The next morning the nice spot has lost his charm, as we wake up to an almost completely white – and not green as it should be – tent. Birdshit. 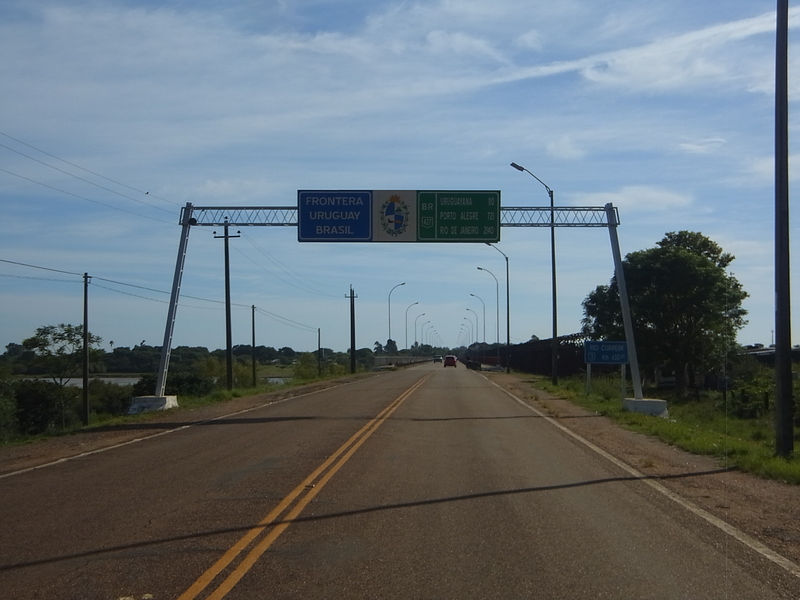 The border between Bella Union (Uruguay) and Barra Do Qarrai (Brazil) is another bridge, but this one we get to cross on our bicycles, as it is a mere 500m across, people are even fishing from the bridge´s edge. It’s very nice to follow you’re adventures, this way! merci voor de toffe reactie. Je mag nog altyd in´t Nederlands schrijven. De blog is in Engels omdat Katharina Duitse is, en Engels was de beste oplossing voor beide. Alles goed gegaan in Andalucia ?